Located in the Red Rock canyon country of the high desert on the Colorado Plateau, Moab, Utah, is right out of the pages of a Western novel. Here in the American Southwest, the rivers are wilder than any script could portray. 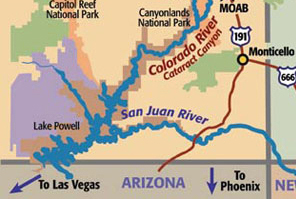 Magical and fun whitewater highways flow through one of the largest river systems in the United States…The Mighy Colorado River. Click on the river name for more information on that river. Moab is located within an hour of Canyonlands National Park and is 5 minutes from Arches National Park.